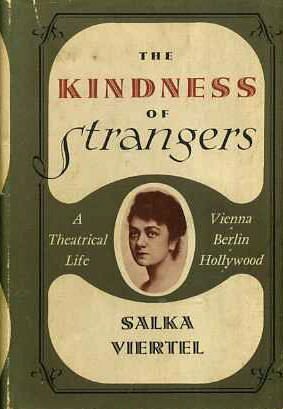 In my new Wall Street Journal “Sightings” column, which I resume this week after a hiatus caused by Mrs. T’s recent illness, I write about the reissue of The Kindness of Strangers, Salka Viertel’s memoir of her life in Europe and Hollywood. Here’s an excerpt. If history is a black comedy—a possibility that I find increasingly probable—then one of the chief sources of its humor is the law of unintended consequences. I doubt, for instance, that it ever occurred to Adolf Hitler that his murderous reign would cause a large number of Jewish artists to flee to and settle in the United States, in the process transforming American culture, high and popular alike. One of the most remarkable of these émigrés was Salka Viertel, an Austrian stage actor who moved to Los Angeles in 1928, opting to stay there permanently after Hitler came to power. “Neither beautiful nor young enough” (in her own crisp words) to be a movie star, Viertel instead set up shop as a screenwriter, making a sizable chunk of money by working on five of Greta Garbo’s films, including “Anna Karenina.” She then used much of it to help other Jewish artists get out of Europe, come to America and restart their lives in the strange land that was studio-era Hollywood. For reasons not obvious to me, this edition has been shorn of the book’s original subtitle, “A Theatrical Life/Vienna-Berlin-Hollywood,” which was at once usefully descriptive and a bit too restrictive. In fact, Viertel’s adventures in Hollywoodland occupy only the second half of “The Kindness of Strangers,” which is in any case far more than just a theatrical memoir. It is also, like Stefan Zweig’s “The World of Yesterday,” a richly detailed, deeply affecting portrait of the lost world of Europe between the two great wars that tore it to pieces. Even before she moved to the U.S. and launched the now-legendary salon to which the members of Hollywood’s German-speaking colony flocked every Sunday, Salka Viertel was the kind of person who had an uncanny knack for meeting everybody who was anybody….